Where does a pastor, worship team or Carrot Top Studio come up with an idea for worship banners? The possibilities are endless! You might consider a liturgical season like Advent, a special occassion such as a wedding, or a visual interpretation of a piece of scripture. 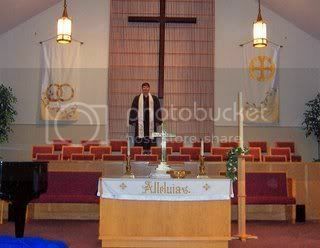 Our latest banners (seen at left) are actually an expansion of the church logo and their motto..."Gathered by His love for us -- Scattered by our love for Him!" We took the logo and created two images (instead of the existing one) and surrounded the images by the arch shape which echoed the sanctuary architecture. The predominant red was chosen as the traditional represention of the Holy Spirit. This was a great collaboration between a worship team that had a vision for a special Sunday that would include an ordination and the team at our studio.